Weather... 10am central update... Tornado Watch for areas west of I65 until 4pm central/5pm eastern. An extension of an additional watch will likely come later from the Storm Prediction Center (SPC). 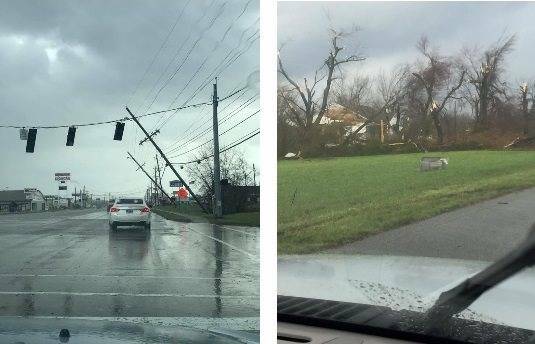 Tornado touchdown near Paducah NWS office just this past hour with significant damage. A broken line / clusters of storm will push east and likely impact I65 corridor. Best guest is around 3-4pm Central. Straight-line winds are the main threat. Tornado activity possible. Some hail possible. Stay with us on the air for updates as storms pass through. There is a lot of residual salt on some roads, which is helping prevent icing issues. Temps will continue to rise, southwest to the northeast and any trouble spots should continue to improve. To set the discussion, temps today are just a bit underperforming when aligned with the forecast. In the central part, we're about 2 degrees off pace. Not a lot.. unless we're talking about position of a freezing line. Then, it becomes a big difference. Between midnight and 3am, precip moves in from the west and temps start to rise through the morning. Confidence is pretty good until we throw in the next variable... where is the freezing line? Here's where confidence goes gown. There are also other factors. Remember ground temps are still cold. 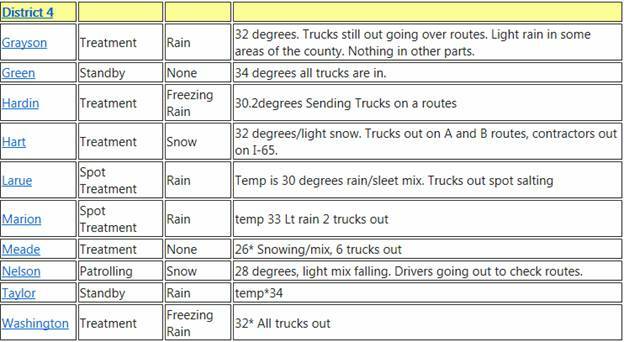 Our pavement forecast model system is showing freezing temperatures for roads until about 7-8am. Parking lots, drive ways, walk ways and untreated roads are very susceptible to a very slick and icy conditions as a change to rain occurs from snow and/or sleet. 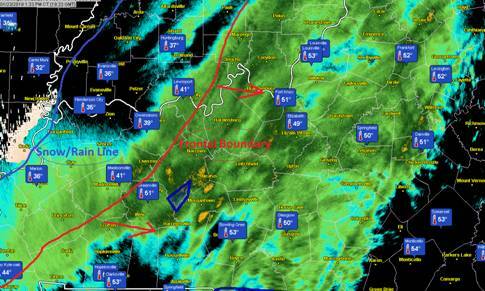 Understand this is advancing line for the precip type/temperature... not the precip, itself. As you can see, they are in pretty close agreement on position and amounts. As I've been saying since early this week, the setup here is tricky as to where the intersections all meet for rain/freezing rain/sleet/snow. For most of our area, I believe there will be a potential for very slick roads and especially untreated surfaces at some point overnight through early Friday morning. -Snow, to mix, to freezing rain and rain is the general idea. -The shift is earlier for our folks to the west and later for the north and east. -Precip begins late this evening and moves east. -Accessing the condition of roads will be tough on Friday morning. Rainy and wet could equal "wet ice cube slick" in some areas. -This isn't a major snowfall. -This isn't a major ice event. -It does have the potential to be very impactful, based on precip type and timing. -Temps critical to the forecast... little change can make a big difference. I will post updates as time permits and the system moves through. Still, it won't quite as bad as Wednesday morning without as much wind. Some scattered snow showers are expected with mostly clouds today, but we'll watch temps closely. Yesterday's model runs put highs in the mid lower 30s for today. That was a much warmer forecast than from the outlook as it stood on Tuesday. This morning, most forecasters are backing off and going back to upper 20s for a high. We'll have to see which pans out. Tonight, a stronger system moves in and if you've been following along my posts, you know I've talked about this for several days now. Snow to the north, mix in the middle and rain on the southwest side as warm air moves north. I'm not going to post a bunch of maps on this go around because, quite frankly, the confidence is on who gets what for Friday morning. In brief, the accumulating snow divide is still around the Ohio River when we look at a model consensus. A mix and change to rain south of that. 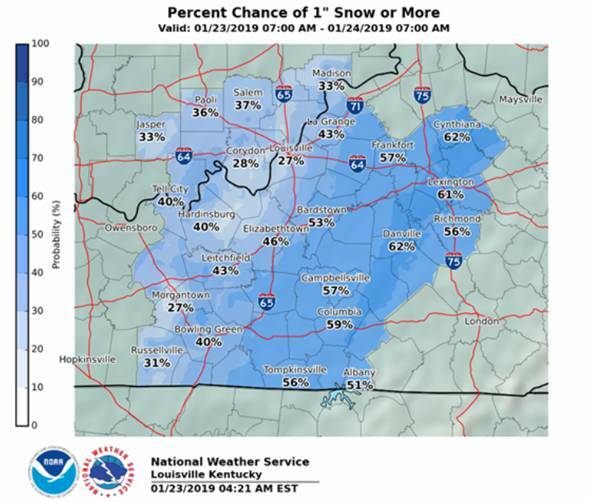 Far Western Kentucky is still a concern for some icing and some light snow for the Bluegrass Region with heavier snow toward Ohio. Again, I want to see the next model run and get a feel for temps today. I'll post an update for Friday morning's forecast after lunch today when the new datasets are in. Another factor is ground temps. They're cold. It's not going to take much overnight for freezing to occur. Any sunshine today will play a big role. 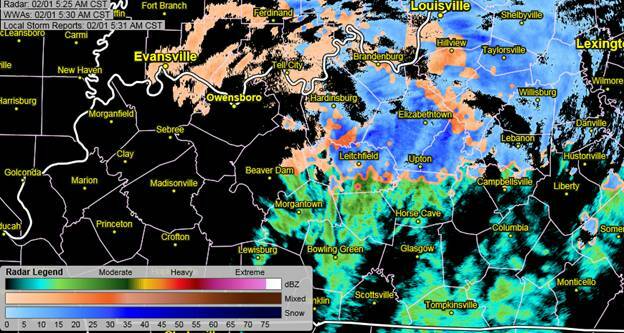 A lot of factors and most of Kentucky is at the precip intersection of rain/ice/significant snow. Even with uncertainty about Friday morning, we will get well above freezing with any precip falling later in the day as only Rain. Welcome to the #realwinter of 2019. Just 36 hours and we'll be back above freezing -- But until then, here's what to expect. -Tonight snow showers will pass through the region and some light accumulations are possible. 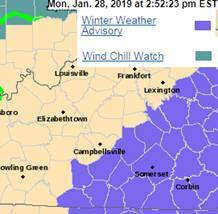 A wind chill advisory has been issued for the region as it will be gusty into Wednesday morning with wind chills -15 to -20 on the northern half of the area. Any snow will be powdery and will blow. Heavy snow showers could result in quick changes to visibility when driving. The most likely time for snow is after 9pm on the western side through mid-morning on the east side. ---- A rough morning for cold and localized blowing snow. -Wednesday will be just flat out cold. Barely into the teens for a high for those in the northern part of the region. Wind chills below zero. Another quick hit of snow showers is possible into Wednesday night. -Wednesday night... Snow showers and the coldest night by temps, but wind chills are not expected as low as what they will be for tonight and in the morning. -Thursday... back into the upper 20s. We'll see if some of the modeling shifts over the next couple of runs. -Thursday night into Friday... Still a little worrisome and not a lot of confidence on where the breakout of snow/ice-mix/rain will line up, but expect a surge of warm air from the south and a snow to ice/mix to rain timeline can be expected. 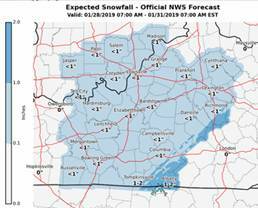 The suspect hours seem to be early to mid morning Friday with accumulating snow on the north side of the system (Southern Indiana/Ohio River areas and east toward the Bluegrass Region) and a mix or freezing rain for Western and Central Kentucky. It will all depend on timing and warm layer advancement. Tomorrow, we'll see what the short models show us for Thursday and see how we can mingle that with longer range data. We should really start to get a picture of the level of concern by this time tomorrow afternoon. -Lots of talk about snow over the past couple of days but cold will be the big story for mid-week. A little snow possible this evening/overnight with snow accumulations more likely to the east and south... then breezy and VERY cold. Ice certainly possible on roads overnight and anywhere from a dusting to a good coating possible west to east across our region. I think some of the forecasts may be conservative on low temps for Tues/Wed nights. Easily the coldest weather of the season. Temps on Friday are in the mid-40s on the current forecast... BUT... That could be a little overdone based on other factors, especially with any snow on the ground. Surface temps will already be cold from mid-week. Any rain falling early Friday morning or sleet could make for a very hazardous start to the day. The map above will likely be tweaked, but the setup and idea of significant snow north and ice on the west/south is certainly worth close attention as we work the next couple days data. Weekend temps will be back into the 50 range with no strong indication of any real cold temps through mid-next week. Some indications are late next week of another cold surge, but that's waaay out. -Rain to snow with icy patches and dusting west to a coating or light accumulations east and south. -COLD Tues-Thursday with breezy conditions... frigid. -Quick snow shot Wednesday evening. -Friday morning weather will be a focus of the forecast as we head through the next couple of days for possibility of significant snow/ice potential. Main points for tonight's anticipated winter weather... Short period of a wintry mix/snow showers expected on the back side of a system as it moves out of Kentucky overnight. Temps in the lower 50's today will help keep ground temps up long enough for significant drying to take place before a lot of moisture from rain freezes. A brief skift of snow up to maybe 1" possible from west to east across the region. Highest amounts of snow are expected to the east/southeast. Residual salt/calcium treatments have mostly been washed away with today's heavier rain showers, so that's not going to be any help. Potential for problems will be late night through Thursday morning commute with lower/mid 20s. So, not extremely cold on this winter shot. Notice about a 10 degree drop over a short distance, but behind that, temps tail off a little more gently. As everything continues to slide off to the east, I believe the snow/rain line will be around the I65 corridor by 8pm-ish. Afternoon commute and early evening traffic will certainly be fine. The question will be does cold air and any lagging moisture overlap. That is more likely to our east, as already mentioned. Obviously, overnight with no solar action on pavement, it won't take a lot of precip to create slick spots, which lends to the concern for the Thursday morning commute. 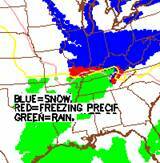 Bottom line, not a major event, but a pesky one that may cause a few delays/cancellations for Thursday morning. 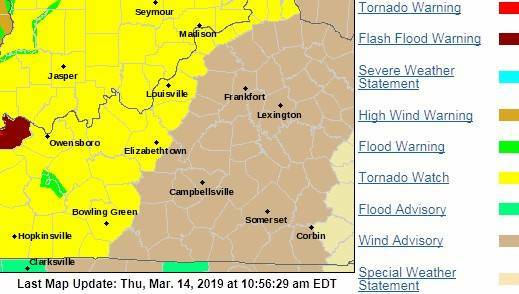 NWS hasn't really said a lot about issuing an advisory, but I can see that happening for late tonight east of I65 and south of the BG Parkway corridor. Their map basically indicates a 50% chance of 1" total snow for that area. Highs on Thursday will be mid-30s and there may be a few snow showers for Thursday evening through the state. Saturday morning may feature light snow, especially on the northern section of the region. More to come on weekend possibilities. Even with the timeline above, the problem will begin because of snow rates... temps aloft are colder. Snow will fall but surface temps will be slower to equalize. Snow rates may be impressive with the changeover, meaning it will coat the roads even though temps are just above freezing. This is hard for road crews, because with high snow rates, a treated/plowed road is back in bad shape quickly. Please take a second to look at the temp forecast before we move on. This if for Etown, a central location. I believe this may be accelerated slightly because of cold air forcing upper atmosphere to lower atmosphere. Temp is red line, dew point is green line and wind chill is blue line. Temps north and west of Etown will crash harder and earlier. Temps south and east of Etown will crash later. 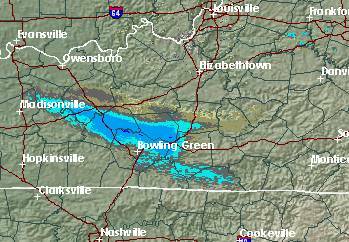 So, again I think south of Bluegrass Parkway and east of I65 should be good for ballgames and for other activities. It will be folks Etown, west and north that would really be concerned about this evening. On the backside, temps will get cold. AND... winds will be brisk. Wind chills will be single digit in the morning. Salt will become less effective and road crews will be forced to use quite a bit of calcium for treatment. Parking lots, driveways and walkways will be slick. Overall, here is the snow expectation, as released by NWS, Louisville... it represents a pretty good consensus. -Early evening impacts north of WK/BG parkways. -Snow rates will be difficult for road crews to keep up with even though temps crash afterwards. -Event will only last 2-3 hours for heavy precip. -Cold/windy on the backside with refreezing.